A delicious fresh Cabernet Franc from the the banks of the Loire made in close proximity to the fabulous and famous Châteaux de Saumur. A supple, berry-fruit laden, medium-bodied wine, which is perfect with cold meats and goat's cheese. Exclusive to Waitrose. Wine of Saumur, France. Suitable for vegetarians and vegans. 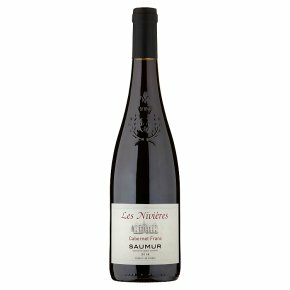 From vineyards planted on the south bank of the Loire around the historic castle town of Saumur, the Les Nivières is made from 100% Cabernet Franc grapes grown on the sand and limestone slopes of the region. Specially vinified to bring out the rich blackcurrant and spice flavours so characteristic of the delicately balanced reds of the Loire Valley, this is a wine to enjoy in the full freshness of its youth. Locally it is served very slightly chilled, making it refreshing on its own or as an enticing match for game, grilled mushrooms and goat's cheeses so typical of the region.